As you read this, I'll be heading back from another glorious week at the beach! 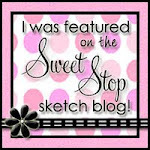 Even so...it is Saturday, and time for another fabulous sketch at The Sweet Stop! Korin always has the most amazing sketches and this one is no exception...I know you will enjoy working with it! Inspirational Nugget: One of the ladies who helps me with my Cherubs class at church on Wednesday evenings is very excited about her new grandson, so I used this week's Sweet Stop sketch to make a baby card for her. Not having been able to have children of my own, I'm always thrilled to hear how others have been blessed with the birth of a new little one! Children really are a blessing, and what an awesome responsibility it is to raise them in the love and admonition of the Lord. Having been a teacher for thirty-five years, it just breaks my heart to see children neglected. When I looked the word "children" up in my Concordance, I was amazed by the hundreds (too many to count), of scripture references there were. "Train up a child in the way he should go, Even when he is old he will not depart from it." (Proverbs 22:6) "Fathers, do not exasperate your children, that they may not lose heart." (Colossians 3:21) "Behold, children are a gift of the Lord; The fruit of the womb is a reward. How blessed is the man whose quiver is full of them;" (Psalms 127:3, 5) Take time to enjoy your children today...and give them a hug from me! Now...on to my card. Creative Nugget: I just love all of the adorable Rhubarb images, but used this baby Rhubarb digi from Sweet 'n Sassy Stamps for my card. The onesie is from a PTI set called "Bitty Baby Blessings." Both images were colored with Copic Markers. One of the little sailboats was punched from the Echo Park DP and added to the front of the onesie. I used my Sew Mini to add stitching to the panels and the scallop border punch gives the illusion of waves for the sailboats on the DP. The sentiment is from another Sweet 'n Sassy stamp set called "Little One." 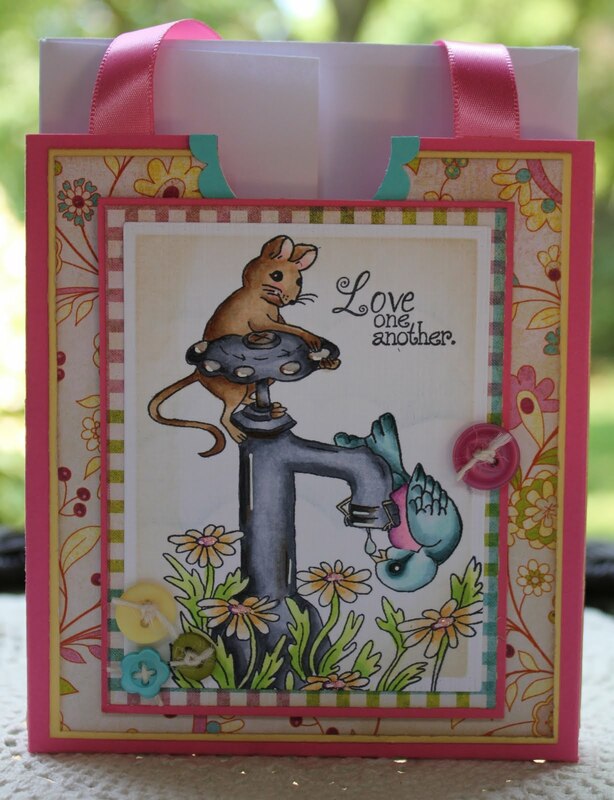 One of the things I love about Sweet 'n Sassy Stamps are the many wonderful verses that come with each set! Now check out what the other Sugar Babies have done with SSS119 and come join the fun! Thanks for stopping by...if you like what you see, let me know. Your comments are greatly appreciated. This is my last project as guest designer on the Sweet 'n Sassy Stamps Blog for the month of July...I just can't believe how quickly the month has come to an end. I have thoroughly enjoyed my time as guest designer. My card today uses the stamp set, Helping Hands. I just love coloring this sweet image with my Copic Markers. 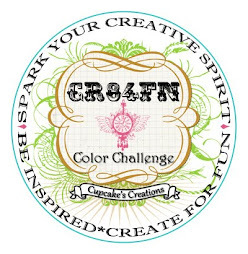 Creative Nugget: Sometimes before coloring an image I like to do a google search to get ideas for colors. I found a rusty, old faucet image and took my inspiration from that. These colors worked well with the Echo Park DP from the "A Walk in the Park" paper pad which can be found at the Sweet 'n Sassy Stamps Store. After coloring my image, I held my breath as I cut it apart into one inch squares. The pieces were put on a piece of wax paper and were covered with Glossy Accents. After the pieces were dry, they were put back together on a piece of Dark Chocolate card stock with spaces between each piece to resemble grout, thus giving the image a tile look. The back of each piece was covered in Scor-Tape to prevent the corners from curling up. All the panels were stitched together and a flower made from a blossom building die was added. You can see the gloss a little better on this close up of the tiled section. This is the first time I've tried this technique and like the results...hope you do, too! 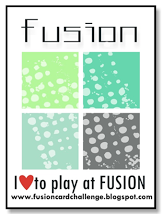 Why not give it a try using any glossy medium you may have on hand? Thanks for visiting with me today. Hope you are staying cool on these blistering, hot days! Summer days just seem to fly by...here it is Saturday again, and I hope you are staying cool! With temperatures at or near 100, these are perfect days to stay in the air conditioning and stamp away. 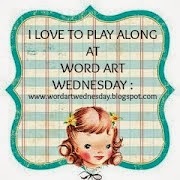 That's just what I've been doing so I have two cards to share with you today. 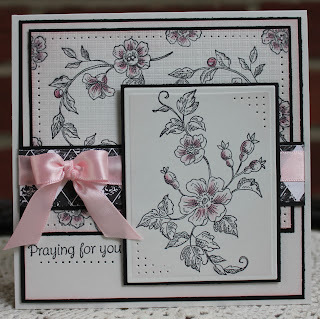 My first card is my design team sample for the SNSS blog. Check out what the other Sugar Babies have done with the sketch and come play along with us this week! 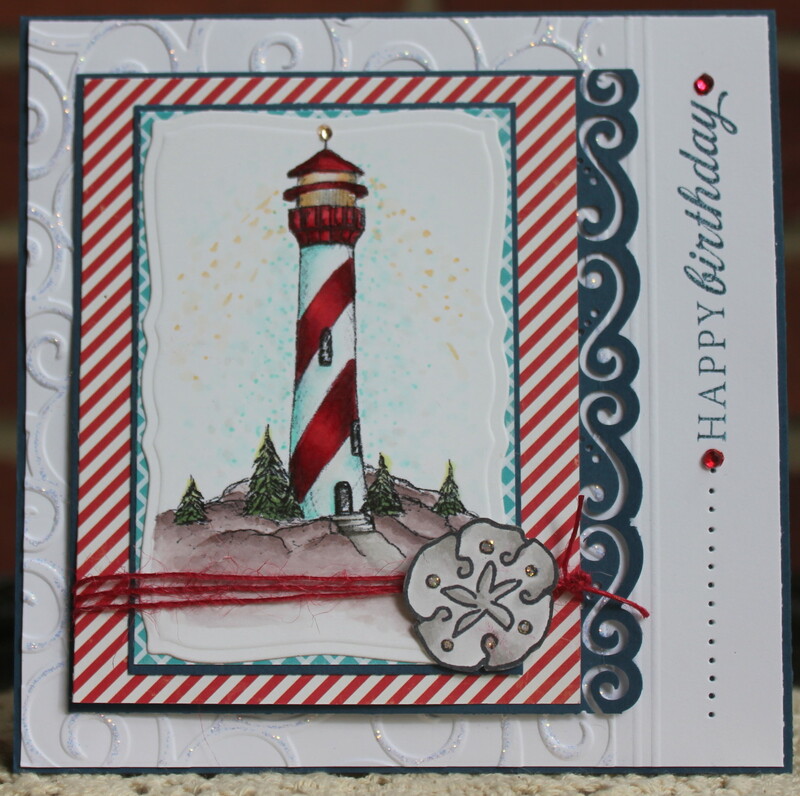 Creative Nugget: Since I'm thinking cool thoughts, I decided to use this lighthouse digi from Sweet 'n Sassy Stamps and flipped the sketch to accommodate the image. The white panel was embossed with swirls and Diamond Stickles were added to the swirls to represent waves. Since the embossing folder was not big enough for the whole panel, I scored two lines with the Scor-Pal, separating the embossing from the greeting. After the greeting was stamped, two colored gem stones were added along with some piercing. The EK Success border punch also gives the impression of waves. 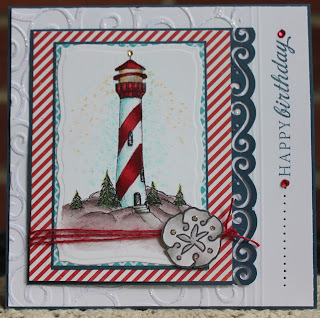 I've learned to appreciate how white space on a card gives a clean and crisp appearance and draws attention to the main image, in this case, the lighthouse. The lighthouse was colored with copic markers and a small gem stone added to the beacon. The button twine was also colored with a copic marker to match the color of the DP. The sand dollar, from another SNSS set called Flourish Seashells, was colored, cut out, and popped up with a dimensional. The Encouragement Ministry at our church decided to do a card shower for our pastor this week to show our appreciation and support for his commitment and faithfulness to our church body. Inspirational Nugget: A good pastor is a true gift from the Lord. "And Christ gave gifts to people ~ he made some to be apostles, some to be prophets, some to go and tell the Good News, and some to have the work of caring for and teaching God's people. Christ gave those gifts to prepare God's holy people for the work of serving, to make the body of Christ stronger." (Ephesians 4:11-12) I am so thankful for a pastor who gives us the truth each Sunday and not a watered down version of the word, a true shepherd who cares for and prays for our congregation. If you appreciate your pastor, why not send a little encouragement his way! 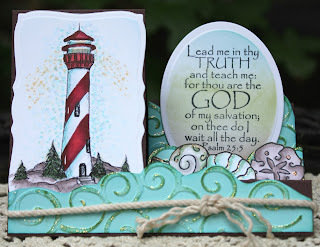 Creative Nugget: I used the same lighthouse Digi on this side step card to send to my pastor this week. 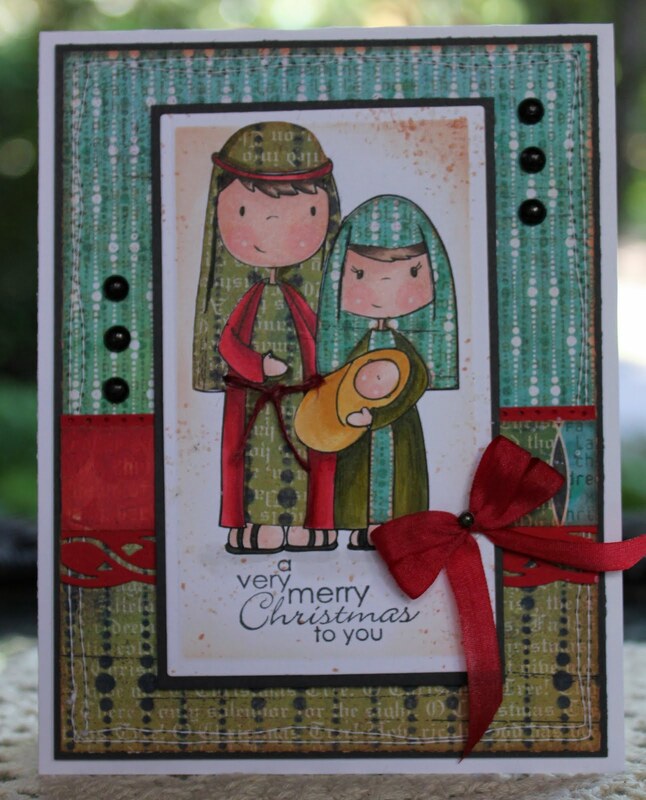 The directions for making a side step card can be found in this resource thread at Splitcoaststampers. Pool Party, Chocolate Chip, and Wild Wasabi were the colors chosen by Mary for CC332, and seemed perfect for a nautical themed card. I didn't have Pool Party so I substituted Cool Caribbean for the embossed waves which were then lightly brushed with the Wild Wasabi stamp pad and covered with Diamond Stickles. The lighthouse, colored with copic markers, fit perfectly on the side step. The other steps were decorated with waves, seashells and a verse from Sweet 'n Sassy Stamps. I hope you've been inspired by one of these projects today...let me know what you think, and thanks for stopping by! 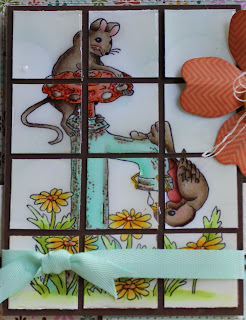 The month of July is rolling right along, and it's time for another Tuesday project on the Sweet 'n Sassy Stamps blog. I have been thoroughly enjoying my time as guest designer. We've been having a heat wave here in Southeastern PA, so I want you to think cool thoughts and take a stroll with me through a delightful country garden, enclosed by a white picket fence. We can stop beneath the shade of sweet, heart-laden trees and bushes along the way. Let's invite that adorable new kid on the block, Rhubarb, to join us on our stroll. 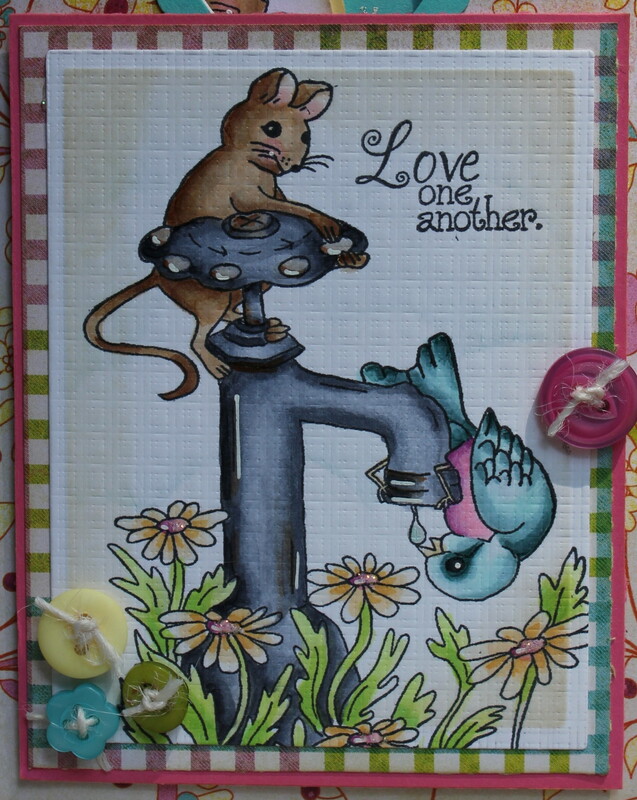 I have a side step card for you today using the new "Love is Like a Tree" set and Rhubarb with Birdie Digi. Creative Nugget: These side step cards are so much fun to make. The directions for the base of the card can be found in the resources at Splitcoaststampers. 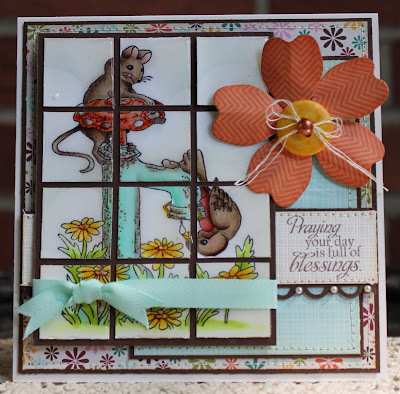 Once you have the base, enjoy decorating each panel or step with stamps, sentiments, or die cuts. The tree in "Love is Like a Tree" fit perfectly on the side panel. I stamped the image twice, cutting one with a scallop circle nestability which was then popped on top of the other image for some dimension. The bushes on the back step were made with just the top of the tree image in the set. Glossy Accents was added to the hearts on the tree and bushes. The Rhubarb Digi was colored with Copic Markers, cut out, and attached to the middle step. The white picket fence in the front was made with a picket fence die and "nails" (black pearls) were attached. Each step was covered with grass which was hand made from green DP in my stash. 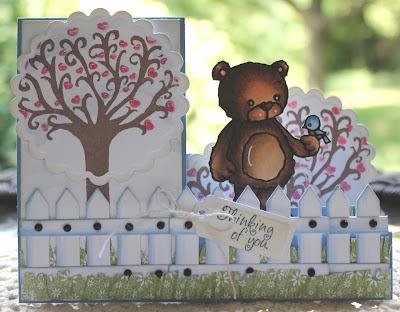 The sentiment from the "Timid Timothy" set was stamped, die cut, and attached to the fence with button twine. That's all there is to it! Thanks for visiting with me today! Hope you enjoyed my project. Check out the stamps and Digis at the Sweet 'n Sassy Stamps Store and try creating your own side step card. Spiritual Nugget: "For God so loved the world, that He gave His only begotten Son, that whoever believes in Him should not perish, but have eternal life." (John 3:16) When I think about Christmas, I am ever mindful of this often quoted scripture verse, the very essence of all of God's word to us! This most precious gift was sent not only for us to celebrate at Christmas time, not only for Christmas in July, but for every day of our lives. Baby Jesus, the reason we celebrate Christmas in the first place, was born, grew up, suffered and died on a cross to take away the sins of the world. He rose again so that those who believe in Him can spend eternity with Him! So...why not celebrate Christmas every day...Merry Christmas everyone! 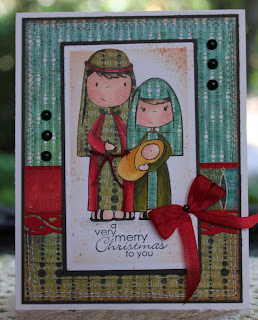 Creative Nugget: For my card today I used this adorable Puddle Jumper Nativity by Lori Designs. Some of their clothing is paper pieced, and the rest of the image is colored with Copic Markers. The stitching around the border was made with my Janome Sew Mini. I was almost finished with this card when my inky fingers left not one, but two smudges ....groan...don't you just hate when that happens? I was not about to abandon this project after spending so much time on it. Do you see the bow and the splatters of distress ink? This is my attempt to cover up the blunder! All in all, I think the card turned out okay and I'm sure the recipient will not even notice the smudges! You will love what the other Sugar Babies have done with this sketch. Join us at The Sweet Stop and get a jump start on your Christmas cards! Thanks for stopping by and Merry Christmas! Happy Tuesday, everyone! My project for today uses the newly released Sweet 'n Sassy Stamp set, "Helping Hands." Korin has done it again...the sweet image in this set is perfect for coloring using your favorite medium and includes five wonderful sentiments. Isn't this set just adorable! Creative Nugget: I've been noticing so many beautiful cards lately with white embossing on colored card stock, so I decided to use this technique to make note cards with all the wonderful sentiments included in this set. The image was embossed with white detail embossing powder on four different colors of card stock, matching my Basic Grey DP. The image was then stamped again on white card stock with Tuxedo Black ink. 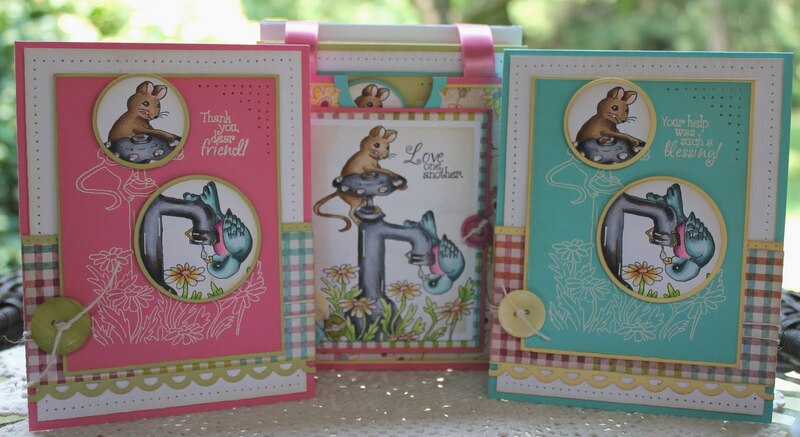 The bird and the mouse in the image were punched out with various sizes of circle punches, colored with Copic Markers, mounted on coordinating pieces of card stock, and popped up on the white embossed image, spotlighting just the cute little helpers on each card. I then made a little card purse that holds all four cards along with matching envelopes. Sending hugs and prayers from the beach at Ocean City Maryland. Our vacation here is coming to an end...we head back to PA tomorrow. What a relaxing and enjoyable time we had here. We had a chance to meet with some very good friends who were here at the same time! Of course Casey was with us and had a wonderful time as well...there was a park that had a beach just for dogs. He was in doggie heaven! I'm ready to get home only because I know that in two weeks we'll be back down! Korin has another wonderful sketch for us this week at The Sweet Stop. I can see myself using this one again and again. Creative Nugget: Here's my card based on this week's sketch. This adorable image is a Mo Manning digital...isn't she just the cutest? She's colored with my favorite medium, Copic Markers. Diamond Stickles were added to the centers of the flowers, the bees' wings, and her flip-flops for some sparkle. The pretty DP is from Cosmo Cricket. I find myself using black...a lot...to frame brightly colored images and DP. It really makes the colors pop! 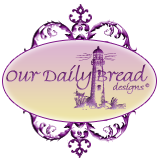 The sentiment is from Our Daily Bread Designs and the cute little bow was made on my Bow Easy. 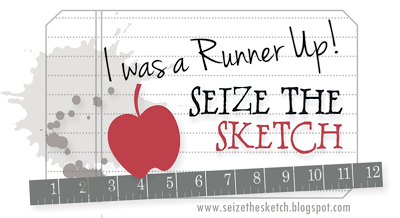 Check out what the other Sugar Babies have done with the sketch and head on over to The Sweet Stop and play along. Thanks for stopping by...I'll be back next Saturday with another sketch from The Sweet Stop! Hi! It's Cathy, (AKA Cathymac on SCS), checking in from the beach at Ocean City, Maryland! 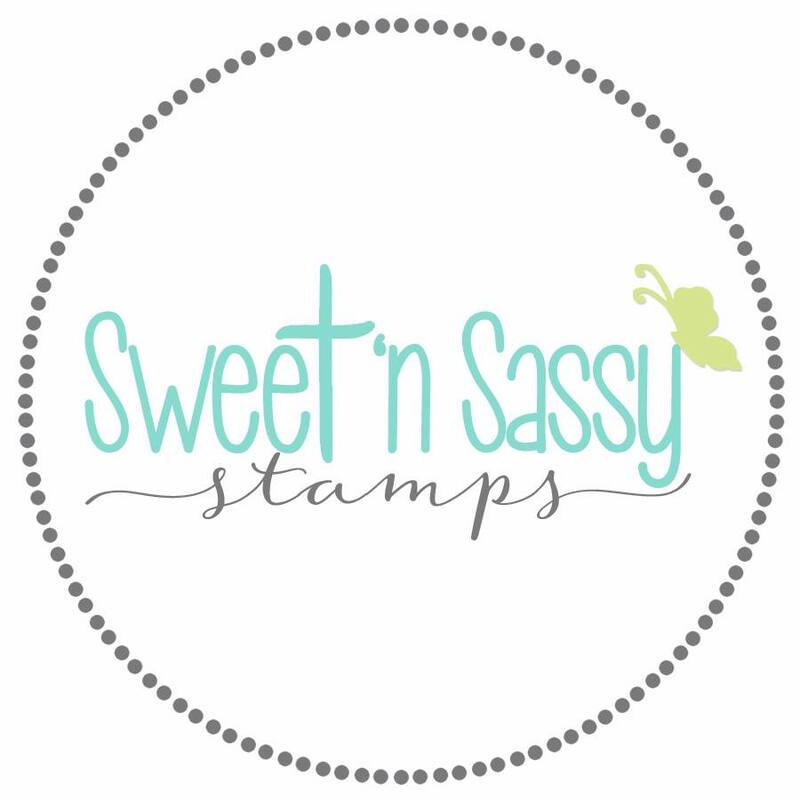 What a privilege it is to be the guest designer for Sweet 'n Sassy Stamps during the month of July. 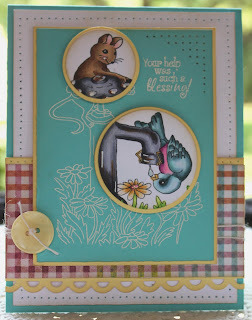 I met Korin back in January at a gathering of stampers from Southeast PA and fell in love with Sweet 'n Sassy's adorable images and wonderful sentiments, many of them scriptural. 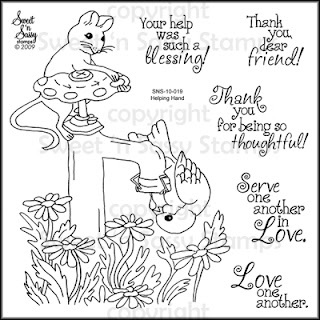 The clear stamp sets contain so many sentiments, making them very versatile. 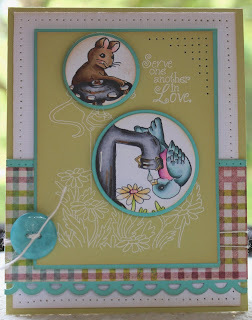 I will be sharing stamped projects with you each Tuesday during the month of July using two of the newly released stamp sets from Sweet 'n Sassy Stamps, "Love is Like a Tree" and "Helping Hand." Before I get to my project today, I have a confession to make. When I first became aware of digital stamps, I told myself that I would never be interested in using them. Some how it seemed like cheating...you know...stamping without actually holding that stamp in your hands...without really inking up the rubber! Well...never say never...I've had a change of heart. I've found that there are many advantages to using digital stamps. After stamping for many years, I have practically no more storage space left in my home...digital stamps are stored on your computer. You can get a digital image almost instantaneously. 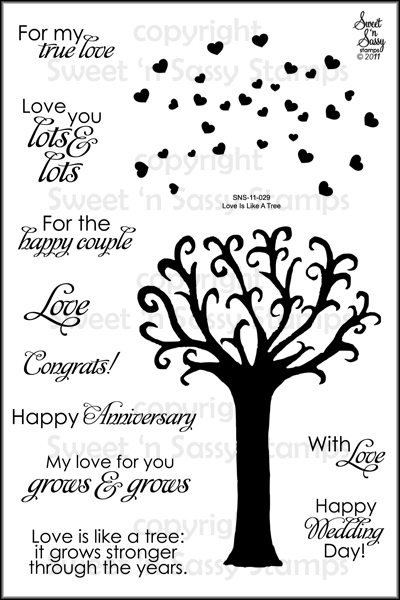 There are many adorable images out there...Sweet 'n Sassy Stamps has many of their images available as digi images. AND they can be resized to fit your project, which brings me to my project for today. 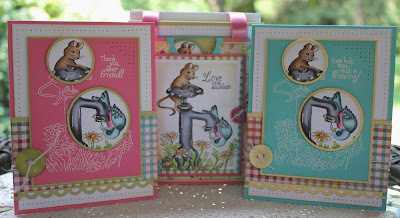 Creative Nugget: When I saw this Melanie Mouse digi image at Sweet 'n Sassy Stamps, I knew she was a perfect match for the "Love is Like a Tree" set. (See...I found a way to use my copics on this solid image stamp set!) I made her small enough to fit in front of the tree and printed her on some white Couture Cardstock. I then made a mask out of a sticky note, and stamped the tree behind her. Clouds were sponged in the background using an old cloud template from Printworks. I then stamped the hearts from the "Love is Like a Tree" set, which fit perfectly on the branches of the tree, and gave them a coat of Glossy Accents. Melanie was then colored with Copic Markers. The embroidery floss on the card was also colored with a Copic Marker. The grass was sponged in with Peeled Paint Distress Ink, and the little heart-shaped flowers were drawn with a copic marker and a Sharpie Poster Paint marker. It's hard to see in the photo, but small hearts were embossed on the black Bo Bunny DP with a Sizzix embossing folder. The Faux brads were punched from Bo Bunny DP and coated with Glossy Accents. Can't you just imagine how the tree in this set could work in every season? I hope you've enjoyed this project, and that it has inspired you to try to combine digital images with stamp sets that you have. Thanks for checking in with us today...now back to the sun and the sand! I'll be back next Tuesday with another project! 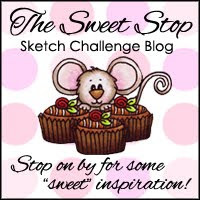 First, let me tell you how excited I am about joining the team of sweet and talented stampers at The Sweet Stop, Sweet 'n Sassy's Sketch Challenge Blog! Each week I will be sharing a new card based on their sketch. Since I needed to make two sympathy cards, I used this week's sketch to make one of them. 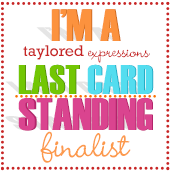 The card below is for my cousin who recently lost her husband to cancer. This was a devastating blow to this wonderful Christian family. 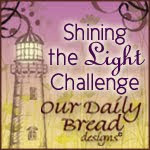 I pray the Lord will sustain them in the difficult days ahead. Creative Nugget: This is my sample for The Sweet Stop Sketch for this week. The Toile Blossoms branch was stamped randomly on the back panel and just a blush of color added to the blooms with a copic marker. 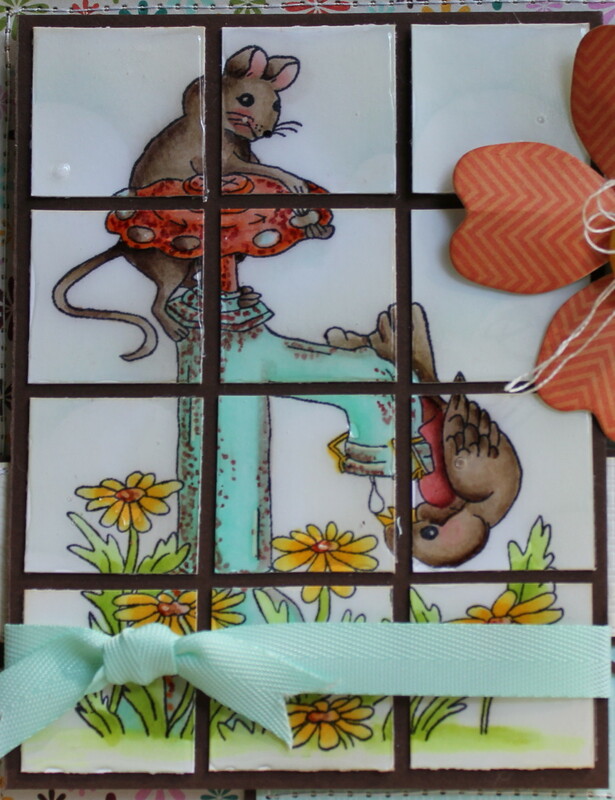 The canvas impression plate and some piercing around the border add texture to this panel. A different blossom branch from the set was used for the front panel. A satin bow and a sentiment complete the card. 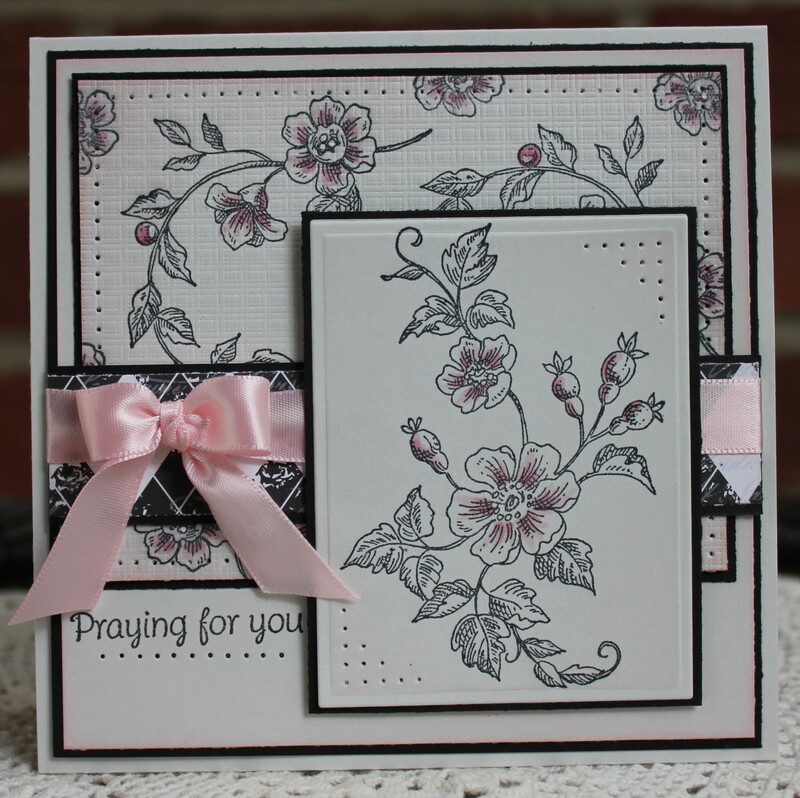 The soft stone, black, and soft pink color palette bring an elegance to this sympathy card. 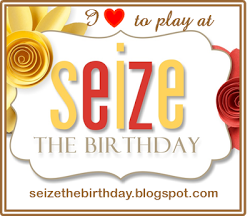 Stop on over to The Sweet Stop to see more fabulous cards created by the other Sugar Babies and join the fun. We'd love to see what you can do with the sketch. Have a wonderful July 4th holiday! Thanks for stopping by!